There is definitely something about Britni. Her music has a soul. 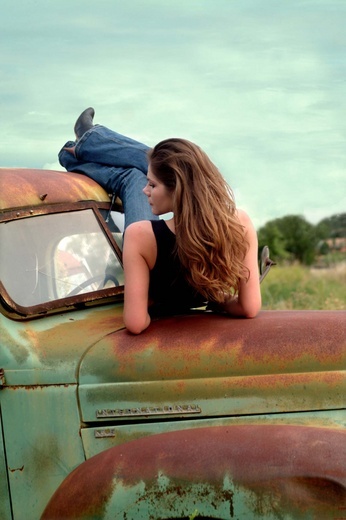 Britni Hoover is where the rubber meets the county road that winds through her hometown of Frederick, Oklahoma. 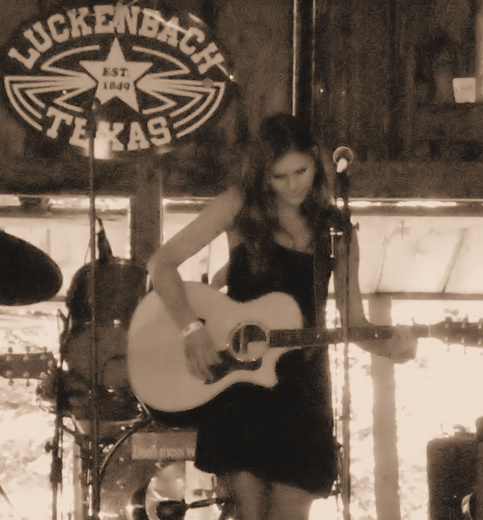 She has been living her dream playing with and opening for some of her favorite artists which include Michael Martin Murphy, Charlie Robinson, Jack Ingram, Mark David Manders, Larry Joe Tayler, Mike McClure, Reckless Kelly, Little Big Town, and the legendary George Jones. 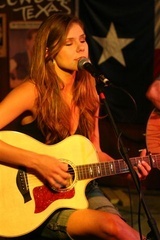 Britni is a real country singer who lives the life she sings about in the heartland of America. Her music represents much of what down-home country music should be by bringing back genuine sentiment and naturalness that is instilled in her music. 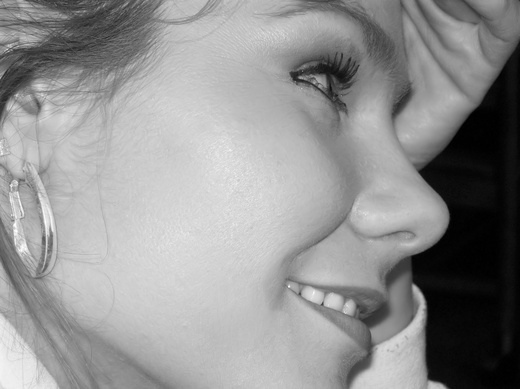 Her rich honey voice has a pulse and a warmth that resonates with an undeniable charm. 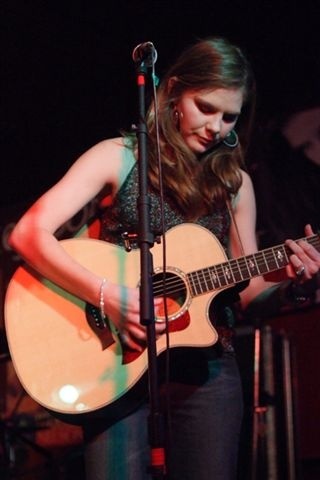 Britni has a born-to-it talent for real country music that just comes natural and never sounds forced. On her recently released album, you will find songs written by Britni as well as artists such as Blu Sanders, Jack Ingram, Mickey Raphael, Taylor Swift, Tony Martin, Mark Nesler, and Jennifer Hanson. 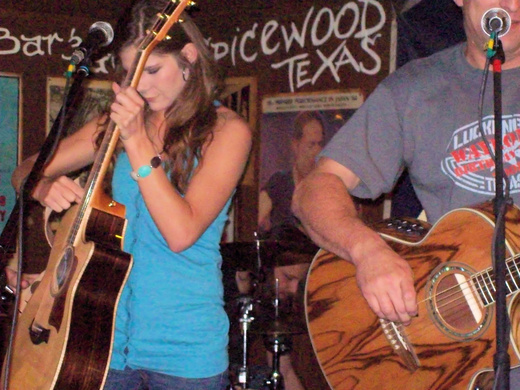 Britni Hoover, who will perform at Poodie’s Hilltop Bar in Spicewood on July 19, is possibly the most self-effacing performer with a heap of God-given talent one will ever have the pleasure of meeting. She has gathered a willing army of gifted musicians and some very respectable songwriters contributing to her new album, Country Strong. When asked what draws this talent to her as a performer, she modestly replied, “I don’t know…I wish I knew. I feel very lucky to get to work with these guys.” “These guys,” some of whom are such profi cient performers as Mickey Raphael, Willie Nelson’s harmonica player; Jerry Holmes, currently touring with K.D. Lang and Mark Tokach and Kim Deschamps, both in Charlie Robison’s band, must have taken notice of Hoover’s sweet tone of voice and the professional but light-hearted way this young woman carries herself. Hoover is an extremely seasoned performer, having fi rst set foot on stage (performing Hank Williams’ “Hey, Good Lookin’”) at the tender age of 3 during a town pageant. She began to perform at local oprys with her portable karaoke tapes at 7. At the grand old age of 14, Hoover began playing with a full band. With all this experience behind her, she still manages to exude a pure and honest love for what she does. “I feel so lucky to be doing what I’m doing. I’m just in awe every time I get to play, or every time someone at a show wants to come up and talk to me,” Hoover declared. “I don’t take any of this for granted, and I could never put one experience over another. Each day I get to do, this is a highlight.” From the early days, her family has played a large part in her development. “It was my mom that put me up to perform at the Frederick (Okla.) Town Pageant when I was 3, and my grandparents funded my fi rst CD ever. It wasn’t anything professional; I guess you’d call it a vanity CD, but their support and encouragement meant a lot to me,” reminisced Hoover. Nowadays, her mom remains a strong presence. “I always sit down and talk with my mom before I go on stage. She’s normally with me, but if not I go off by myself for a few minutes and call her. She and I are very close. I don’t know what I’d do without her.” This Saturday at Poodie’s, Hoover will be playing what she calls a “strippeddown” acoustic set. Hoover will sing and play guitar while her long-term musical companion, Eugene Brown, provides acoustic guitar accompaniment. Backing them up with harmony vocals will be Eugene’s daughter, Evelyn. You can expect to hear all 11 songs from her latest release plus a few other songs. “It’s going to be a laidback show,” Hoover explained. “There’s something about just turning it down a notch, the intimacy of acoustic gigs, that gets to me. It seems to me that when you’re not as loud the audience is more apt to actually listen and take in the music.” Britni Hoover performs at Poodie’s on Saturday at 10 p.m.